Blackjack gets its origins from Europe. At least that’s what we believe. The man who authored Don Quixote once wrote a tale of players cheating at the game back in the early 1600’s. We can assume that Blackjack has been played in Europe for centuries. The game has gone through many changes over time and has evolved into a multi format game that has various rules in different spots of the world. The two most popular forms of Blackjack in a live casino are the American and European versions of Blackjack. These are the most widely spread games in casino for various reasons. The main one is the advantage the house has in these 2 forms of the game. Today were going to discuss the European version of the game and its unique rules that have numerous effects on how you play the game. The standard, make a 21 and beat the dealer rules all apply in this version; but, the way you get there, and the various rules along the way are what make European Blackjack different from the rest. European Blackjack uses 8 decks. The dealer must stand on both hard and soft 17’s. European Blackjack takes some of the fun out of the game by allowing you to double down only when your first 2 cards total 9, 10 or 11. Players may double down on a split hand, but only if they total the same 9, 10 or 11. Players may only split once during a hand. And to take it a step further, you cannot split 4’s, 5’s, or 10 point cards. You can use the early surrender option if the dealer shows a 10 or Ace. If you decide to use this option, only half of your bet is taken, and you forfeit the rest of the hand. Another big difference in European Blackjack is that the dealer will not have to peek at his hole card. 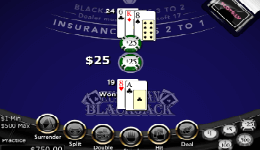 Usually, in most Blackjack variants, the dealer must peek at his hole card when they have a 10 or an Ace showing. If they have Blackjack, they must announce it right away. In European Blackjack, you have no clue if they have 21 or not. This drastically changes the tone of the game. For example, you might split or double only to find out that the dealer has blackjack. Almost all the rules are designed to increase the house edge. Consequently, the house edge is almost double than other forms of the game. European Blackjack has a house edge of 0.62%. Compare this to 0.35% in a game such as Spanish 21 or Atlantic City Blackjack and you’ll see the difference. 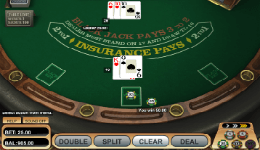 Much of the strategy remains the same as you would be playing a standard game of Blackjack. Double on all 11’s, split Aces, and so on. The most important strategy is to use the early surrender correctly. If your total is 12 to 17, or 5 to 7, and the dealer shows an Ace, take the early surrender. If you total 14 to 16 and the dealer shows a 10, take the early surrender. Using this strategy will have you playing at an optimal level. It’s important to note that some rules may change depending on where you play European Blackjack. Some casinos in Europe use 6 and even 4 decks, while some have changed the rule on splitting 4’s, 5’s and 10’s You may also not find the early surrender option at all casinos. 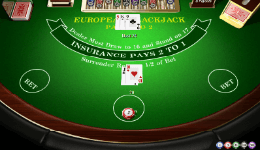 While European Blackjack does have it disadvantages, it is the easiest form of the game to play. It’s great for beginners to learn since it doesn’t have too many complicated twists.